U.S. Moves To Settle American Indian Suit For $3.4B Under an agreement announced Tuesday that still needs congressional approval, the Interior Department will distribute $1.4 billion to more than 300,000 tribe members to compensate them for historical accounting claims. It also will spend $2 billion to buy back and consolidate tribal land lost by previous generations. 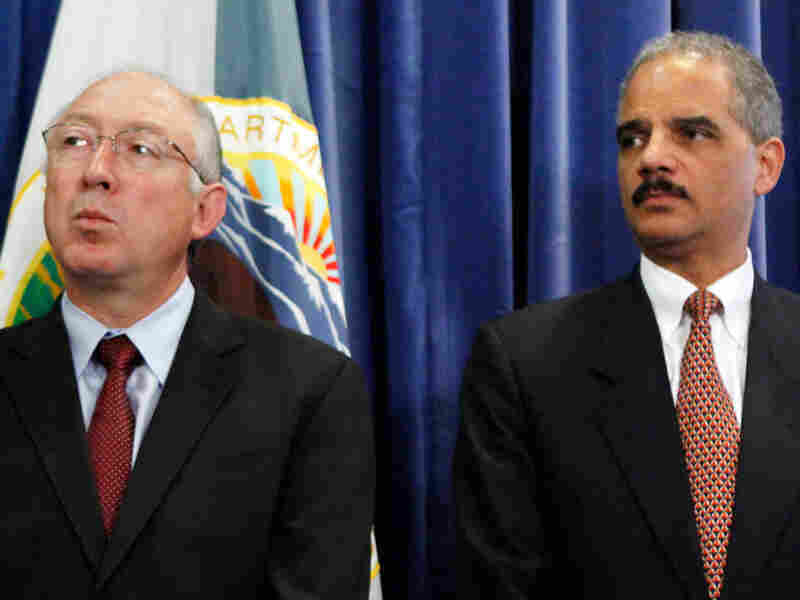 Attorney General Eric Holder (right) and Interior Department Secretary Ken Salazar announce a proposed settlement Tuesday of a lawsuit alleging American Indians' trust accounts were mismanaged by the Interior Department. The U.S. government on Tuesday moved to settle a long-running lawsuit over royalties owed to American Indians for use of tribal lands, proposing the creation of trust funds worth $3.4 billion and a $60 million higher education scholarship fund. The class action lawsuit Cobell v. Salazar alleged that the federal government mismanaged more than 300,000 American Indian trust accounts for more than a century. The American Indians claimed they were deprived of money they should have received for sale or usage of land for oil, gas, grazing and timber overseen by the Interior Department since 1887. Under the proposal, more than 500,000 holders of Individual Indian Money (IMM) accounts could be compensated. In addition, the settlement calls for establishment of an Indian Education Scholarship Fund of up to $60 million to improve Indian youths' access to higher education. The settlement will require court and congressional approval. Elouise Cobell, the lead plaintiff in the case, said in a statement that the settlement falls far short of what the U.S. government actually owes American Indians, but she said it was the best settlement they could get. "This is a bittersweet victory, at best, but it will mean a great deal to the tens of thousands of impoverished Indians entitled to share in its financial fruits, as well as to the Indian youth whose dreams for a better life — including the possibility of one day attending college — can now be realized," she said. Attorney General Eric Holder and Interior Secretary Ken Salazar said the settlement of one of the largest class action lawsuits ever filed against the U.S. government has been a top priority for the Obama administration. "Between the settlement and the trust reform measures that the secretary is announcing today, this administration is taking concrete steps to redefine the government's relationship with Native Americans," Holder said. Cobell, executive director of the Native American Community Development Corp., said many of the plaintiffs have died since the suit began to wind its way through the courts in 1996. The original lawsuit was filed by Cobell and four other Indians on behalf of present and past beneficiaries of individual Indian trust accounts, including 300,000 then-current IIM account holders. "Time takes a toll, especially on elders living in abject poverty," Cobell said. "Many of them died as we continued our struggle to settle this suit." In a statement, President Obama lauded the settlement as a step toward improving the relationship between American Indians and the federal government. "As a candidate, I heard from many in Indian country that the Cobell suit remained a stain on the nation-to-nation relationship I value so much. I pledged my commitment to resolving this issue, and I am proud that my administration has taken this step today," he said.